This week, I wanted to share a piece that a student wrote about weaving terminology at the end of her Weaving I class at The Weavers’ School. A reed doesn’t just grow in a swamp. A tabby isn’t just a kind of cat. A beater isn’t just for making eggs. Sleying isn’t just something you do to a dragon. A castle isn’t just where a princess lives. Baby wolves don’t just come from mommy wolves. A draft isn’t just a cold beer. A profile isn’t just what someone looks like from the side. A pick-up doesn’t just happen in a bar. Tying one on doesn’t always lead to a hangover. Crosses aren’t just in churches. A cone doesn’t just come with ice cream in it. A shot isn’t just something you get at the doctor’s office. A shed isn’t just where you keep your gardening tools. A temple isn’t just a place of worship. A shuttle isn’t just a bus to the airport. A gamp isn’t just a mythical creature you might find in a fantasy tale. A choke isn’t just something that happens when Madelyn or Suzie takes you to a new loom and reviews the weaving instructions. If you have a weaving question please email Madelyn! 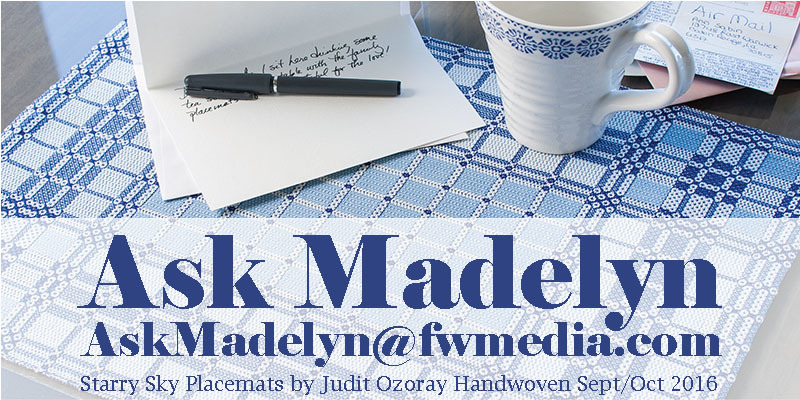 View related & recent “Ask Madelyn” posts! Explore weaving resources in our shop!